Located on the west coast of Hudson Bay about 300 km north of Churchill, Rankin Inlet is the transportation, health services, and business centre of the Kivalliq Region of Nunavut. Rankin Inlet has a rich mining history. The town grew up around the North Rankin Nickel Mine, which operated from 1957 – 1962. The underground miners were Inuit from all over Nunavut. The Federal Government started a soapstone / clay project in the early 60’s after the mine closed to help create a sustainable economy for the Inuit. Today, many of their children and grandchildren are working in mining and related industries, for the Meadowbank Gold Mine, the new Meliadine Gold Project and other mineral exploration projects in the region. Our community is the Kivalliq centre for government and educational activity, but private business also thrives. Business activity includes everything from arts & crafts, tourism and country food processing, to construction, restaurants, and hotels. There is large government activity as well. We have all the amenities you expect of a Northern hub, including a downtown area with offices, the RCMP detachment, Hamlet office, hotels, shopping, apartments, banks, schools, and the post office. There are five hotels and a bed & breakfast, several restaurants, a dental clinic, drugstore, three convenience stores, and 2 hardware stores. The health center includes a hospital and a birthing center. Nunavut Arctic College offers many courses that prepare people to work with government or business, and the associated Trade School prepares Nunavummiut for careers in trades like electrician, housing maintainer, plumber and heavy equipment mechanics. Step outside and you’ll feel the pulse of the activity that drives our community. Rankin Inlet combines the best of land and sea. Rocky islands with sheer cliffs support one of the healthiest populations of peregrine falcons in the world, and several rocky rivers offer great fishing for arctic char and grayling, and wide inland lakes harbor large lake trout. Great gravel eskers snake across the land, enticing families out for superb berry-picking in late summer. Tundra swans nest on the edges of larger lakes, and the land echoes with the rattling calls of sandhill cranes. Comical sik siks (arctic ground squirrels) stand like sentinels along the roads, and Arctic foxes and hares can often be seen. Caribou from the Qamanurjuaq herd often pass close to town in late summer. Ringed and bearded seals and beluga whales are commonly seen on boat trips from the community, and polar bears are sometimes seen at Marble Island or on other islands. Whether you are here for business or pleasure, there is a lot to see and do during your visit to Rankin Inlet. 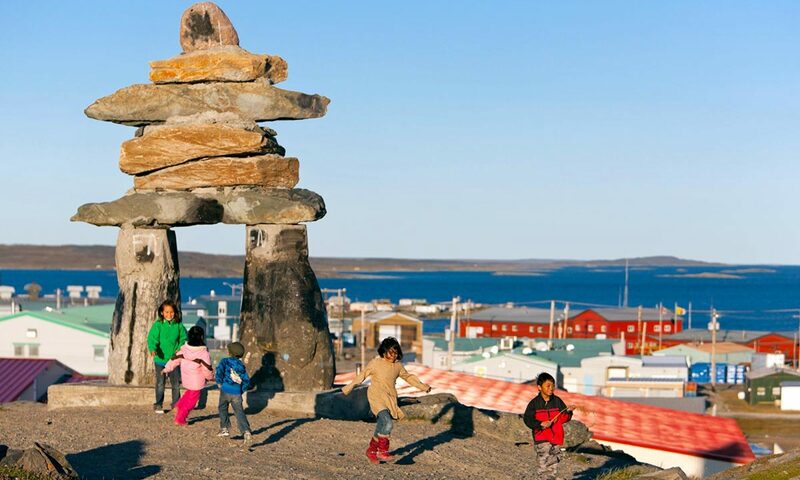 We hope you enjoy your time in one of Nunavut’s busiest communities!